As a professional fine art shipping company, Fine Art Shippers specializes in the local and long-distance transportation of art, antiques, and other valuables. However, our team is also equipped and properly trained with the best practices for shipping a piano of any weight and size. Plus, our services include secure storage and custom crating for the international transportation of this large musical instrument. Shipping a piano is completely different than shipping any other object. In fact, this work is always quite a feat even for experienced piano shippers. 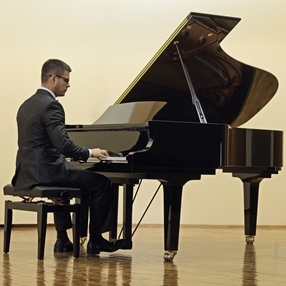 For this reason, it is so important to hire a reliable company able to handle any type of piano move. At Fine Art Shippers, we understand your concern and know that your piano is not just a large and bulky item but also a delicate musical instrument that requires special attention during the entire process of transportation. Shipping a piano is like art to our team, and we treat it with the utmost care it deserves. Shipping pianos of any size is both a technical and complicated task. Piano shippers must be not only experienced but also dedicated to the successful packing, loading, and moving of these valuable instruments, not to mention that this job demands a great deal of human strength. Moreover, since different pianos are made from different types of wood, piano shippers should understand these woods and use the right packing and moving techniques to protect each of them in transit. This is exactly what we offer you at Fine Art Shippers! Shipping a piano with us is always safe and comfortable, and you do not need to worry about anything. What is no less important, our piano shipping services are not limited to only long-distance move across the United States. Fine Art Shippers can ship a piano to literally anywhere in the world while ensuring its protection from being damaged in transit. Besides, we take care of all customs clearance formalities, documentation, and paperwork, which allows our clients to focus on other important aspects of the international move. Whether it comes to a “small” modern piano or a huge antique musical instrument, your piano will be carefully packaged and handled, with no detail spared. Shipping a piano is our specialty, and we know how to deliver it safe and sound to any location. Please do not hesitate to contact Fine Art Shippers to find out more about our piano moving services!